Fencing is often called “physical chess” because it requires the fencer to develop mental tactics and strategy along with physical skills and athleticism to defeat an opponent. Fencing is challenging, but it is also very fun, exciting, and rewarding. 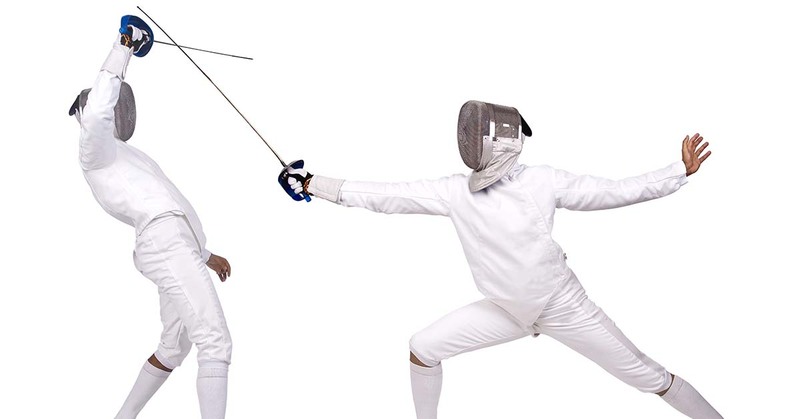 Fencing at the high school level provides extra opportunities for admission to the best colleges, nearly all of which have fencing programs. College administrators know that, in addition to the physical attributes of speed, hand-eye coordination, and quick reﬂexes, most successful fencers are intelligent, creative, disciplined, and have excellent problem solving abilities. The sport of fencing is fast and athletic, a far cry from the choreographed bouts you see on film or on the stage. Instead of swinging from a chandelier or leaping from balconies, you will see two fencers performing an intense dance on a six-foot by 44-foot strip. The movement is so fast that touches have to be scored electrically — which makes fencing a lot more like Star Wars than Errol Flynn. At Lilov Fencing Academy, your child will learn the art of fencing from instructors that have years of experience coaching and fencing. We’re one of the country’s oldest fencing schools and we have prepared many students to fence at the college level and beyond. If your child is looking for a way to train their mind and their body in a sport that is always looking for the best young athletes, fencing might just be a perfect fit. Contact us today for more information about our fencing lessons and fencing camps.